Anna Christian is the author of six books, Then Sings My Soul (2015); Daniel’s Wife (2010); The Big Table, an illustrated children’s book (2008); Mrs. Griffin is Missing and Other Stories (2005); The Newcomer (2013); Bobby and Sonny Mysteries for preteens; and Meet it, Greet it, and Defeat it! The Biography of Frances E. Williams, Actress/ Activist (1999). 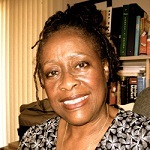 She has two biographical entries in the 2008 African American National Biography Project published by Oxford University Press: one of Frances E. Williams and one of Rupert Crosse, actor. She also has a personal narrative in Black Lives Have Always Mattered, a collection of essays, poems, and personal narratives, (2017) edited by Abiodun Oyewole, published by 2Leaf Press. In addition to her blog, “Celebrating Life” on blogspot.com, she writes book reviews that appear in Goodreads.com. She has also blogged for Oxford University Press. Christian has an M.A. in English from California State University, Los Angeles (CSULA). She has taught Language Arts for LA Unified School District, Moreno Valley Unified School District from which she retired, and was an adjunct professor at Riverside Community College. Presently she facilitates a Creative Writing/Life Story class at the Moreno Valley Senior Center. She currently resides in Moreno Valley, California.